Big Laurel Falls is on the way to Virgin Falls. 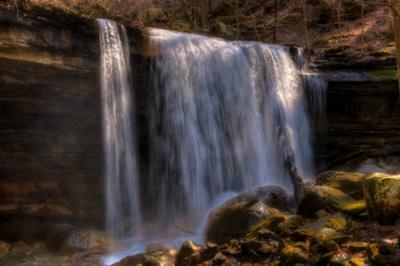 Virgin Falls is located southeast of Sparta and is accessible via Highway 70. Go to the community of DeRossett, 11 miles east of Sparta, turn onto Eastland Road and proceed six miles to Scott's Gulf Road. There, you will see a sign for the Bridgestone/Firestone Centennial Wilderness. Turn right onto Scott's Gulf Road and proceed two miles to the parking area and trailhead on the right side of the road.